How can a student search for a course ? The pre-formated page where courses appear do not have a search box. In fact, i can not find a way to search for a course. According to this image I think you have a bug, have you looked into the widget area? I am using another theme but with the default theme, its the same. When we select the courses menu item, no widget area appears. I checked this in my system, and adding the default WordPress search widget seems to work fine. I was able to search for courses with the default search widget. 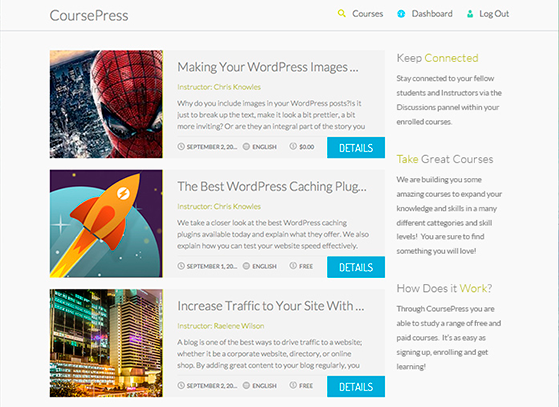 However, by default /courses page doesn't have a sidebar to add widgets. You'll have to override the /courses page template, by creating a archive-course.php in your themes folder, so that the template would consist of a sidebar.